Recently in my interactions with some fellow teachers, I’ve been shocked and saddened to hear how many teachers have their hands tied with this restriction: No negative consequences. And as I search my brain for suggestions or encouragement, I often come up empty. I can’t imagine running my classroom without consequences. In fact, when I shared in my post How to Calm a Disruptive Class: The Quick & Easy Method that Saved My Sanity how effective it is to write students’ names on the board, I received quite a few comments about how this type of method is not allowed in their schools. A few even raised concerns that such an approach can be dangerous, as it can harm students’ self-esteem. Now don’t get me wrong, I believe in positive reinforcement, and I would argue that you certainly should not publicly humiliate a student. But consequences…..or reprimanding a student….or singling out someone who is misbehaving? These should not be taboo! Yeah, yeah, I know that the reason for these “no consequences” policies is to avoid hurting kids self-esteem. But there’s one big problem with that. This probably warrants a whole separate post, but we are way too concerned with self-esteem in our society. Yes, children and teens need to understand their self-worth in Christ. But they also need to be confronted with their sin and mistakes. Never addressing the problems is not helping them – it’s crippling them. Young people who have been coddled their whole life and have never had to face their own flaws will not be prepared to be successful and influential adults. Plus, does it really help to build self-esteem if you never face difficulty and overcome it? Learning from your mistakes is an important part of growing up, and often it takes negative consequences to motivate someone to change. Consequences promote personal responsibility. One of the most important traits we need to teach our students is personal responsibility, and when coupled with positive motivation, consequences are extremely effective at doing this. You were well-behaved today? Great job! Keep it up and you’ll earn (whatever reward is appropriate). You disrupted class? Here are your consequences. And I’m going to have to write a whole separate post on letting students fail…. Consequences help keep order. There is just no doubt about it – a classroom with consequences will be more orderly and productive than a classroom without them. It’s just a fact. While kids will work towards rewards, and rewards a great incentive, they are not enough. There are some kids who need consequences to stay on task. And a teacher who cannot give consequences (even as a last resort) has a very unfair disadvantage. What if Consequences Have Been Banned from Your Classroom? If you’re a teacher in a school where consequences are taboo, I’d love to hear from you. What challenges has it created? How have you overcome them? My biggest encouragement to you is to not just sit idly by and let this trend continue. Talk about it with your administration and fellow teachers. Be respectful, of course, but argue the points. Don’t be intimidated. Be bold and advocate for what our students really need, even if it’s not what they want. 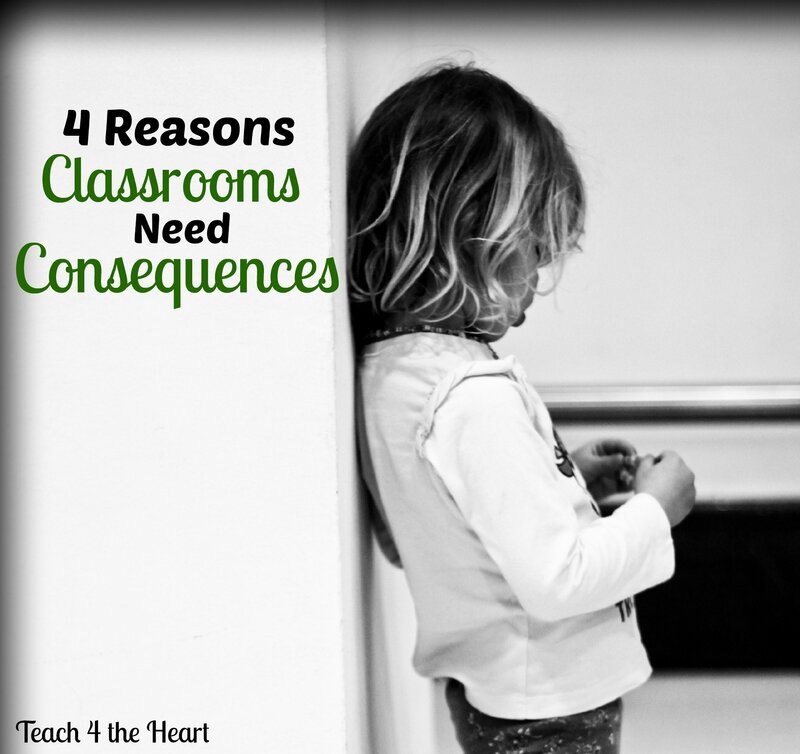 Do you agree that consequences are an important part of the classroom? If not, why not? Share your thoughts and experiences with a comment below. I couldn’t agree with you more. We automatically associate consequences with negativity. How about the POSITIVE result of having kids understand what that their actions have consequences in the real world? Consequences must be thoughtful, not arbitrary (of course), but are necessary in teaching the “whole” student. Well said! Just as in life actions cause things. I am going to give a VERY simple example. Using the bathroom in my college classes. Use the bathroom whenever you want However, I won’t repeat material that you miss when you leave. What’s the consequence of leaving my class, they don’t get the information. What about turning in late work. Of course! However, it will lose 10%. It is only fair that they lose points since they had longer to do it. Students need to realize that actions have consequences. I agree natural consequences are best. It is important to remind the student what those consequences are. For an example…..when outside especially, If you hurt another student you will care for that student at least as long as they are injured. This fosters the nurturing pf the injury and heck if I hurt little Johnny I am going to have to stop the action I wanted to do in the first place. …. if they refuse i give little Johnny twice the attention and big bully twice the time to work it out. 100% I agree that consequences are important in every child. What i have been practicing is to let the students decide of the consequences. Once one violates it, I simply , gently ask ,” And what is our agreement?” . Without much ado, student perform the consequence. One time, oir head teacher came in to observe my class. After the discussion, my target for class participation was the slow one. To be able for him to answer, I threw the question first to the bright one, to be repeated by seatmate until he has the chance to participate correctly bec it has been repeated more than twicd if necessary. But the problem was that the first boy , tje bright one I called was not able to answer. I was torn between myself and the student. Who shall I save? In my mind I called God. The answer was “the boy”. Never mind if i wlill be scolded by the head teacher right there or later after class. So , pretending everything was ok, after a few seconds while starring at the boy, as he was also starring at me as if begging, I asked him what was the agreement if one could not answer bec he is not listening. He said ” Kneel , Ma’am”. Students were so quite.The boy kneeled. And i had to repeat the question, praying in my mind it will be answered correctly, asking the boy kneeling down to listen carefully, so he could repeat it, and praise the Lord, the next bright in class abled to answer it correctly , and the kneeling boy had repeated it correctly. From that day on, there was a huge change in that class. They became more attentive. And the head teacher? She appreciated me for being CONSISTENT in imposing discipline. But I tell you, that was the scarriest thing I had done in my life as a teacher. Good evening, I just came across your blog today. It’s so great to see that there is a community of Christian teachers who are so willing to share what they know and do what’s best for the kids in the sight of God. I completely agree that students must be taught the necessary skills to survive in the greatest school, The University of Life, and consequences are a huge part of that. Therefore, it is our duty as teachers to prepare our students accordingly. The Word of God states in Proverbs 23:13a: “Withhold not correction from the child…”. The scriptures speak extensively of correction for all of us (even us adults). Therefore, it is a great thing to see more and more teachers coming to understand that and put it into practice. Not only am I a first-year Middle School teacher, but I also started my job in late November (three months into the school year). Things are tough, but I’m not discouraged and I look forward to continuing to trust God and learn all that I can. You all seem amazing, and I truly look forward to reading on and continuing to grow and learn from all of your wisdom. I’m a substitute and a relatively new teacher. I just did my student teaching this last semester. I experienced something I never thought would happen. I was substituting for a teacher that co teaches and moves rooms all day long. Into 3rd and 4th period the teacher because of the schools problems with lack of consequences could not get students to cooperate. I said to a group of them, “Hey, you need to have respect for your teacher in the same way you’ll want to show respect for a job someday.” Later that day in another class a student also kept refusing to do what they were supposed too so my attitude may have come out a bit. But hey in my opinion it wasn’t inappropriate and it worked they sat down. I actually got called to the principal as a teacher? Really, instead of the students getting consequences. The referral was even ignored I filled out! I was told by by the schools principal that I should let the teacher teach. So guess as a substitute I’m supposed to stand and do nothing because literally all I did was request them to work after that and before that. They didn’t like it so went to their principal. What’s worse is the principal never even talked to the teacher to see if I indeed had said anything inappropriate. I’ll put it this way. My daughters friend died in a shooting and she was just in the wrong place. She made a bad choice. I’d rather these students have to deal with negative consequences now than have to experience what we have in life. The teacher I was with during 3rd and 4th told me not to worry about it that this is how his school is about student discipline and consequences. I just can’t believe it and what is worse is I have another 8 days there before being able to sub somewhere else.